Take your business to the streets and fight your way to the top. Click here to play! There is plenty at stake here, but if you manage to overcome all the odds and win you will be paid out more than handsomely. 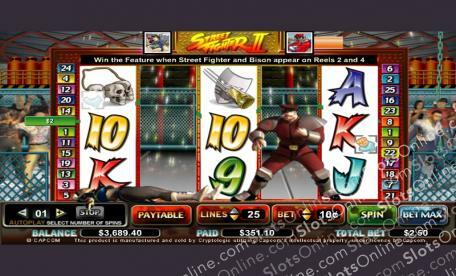 Join the motley crew once again in this exciting Street Fighter based slot machine. You will play over 5 reels and 25 pay lines, with the more lines activated increasing your payout odds on winning combinations. When you first jump into a game of Street Fighter you will get to choose your very own character to be a Substitute. Then, if you manage to make it to the Free Games Feature, your selected character will take on the evil Bison. The Street Fighter logo is scattered and will pay out up to 100 times your initial wager. There are plenty of simple symbols that will help fill up your pockets, with payouts odds of up to 5000:1 on winning combinations. Take charge of your chosen warrior and defeat Bison to earn yourself some incredible winnings. The Street Fighter logo is Scattered and will pay out up to 100 times your initial wager when you manage to spin up all five of them in one go. Before you start playing you will be given the opportunity to select your Substitute character. Make it to the Street Fighter Feature and you will face off against Bison. When your selected Street Fighter and Bison appear on reels 2 and 4 respectively, you will be sent straight to the Bonus Round where the two will face off for glory.